Whether you’re healing from a broken heart, period of depression, miscarriage, loss of a loved one, or any other pains of this world, I hope that these will provide you with a sense of peace and renewal. Many of these verses play back in my mind during times of need, like Isaiah 41:10, while I was waiting at the hospital before my last surgery. This is what the Lord says: I have heard your prayer and seen your tears. I will heal you. Wait for the Lord; be strong and take heart and wait on the Lord. 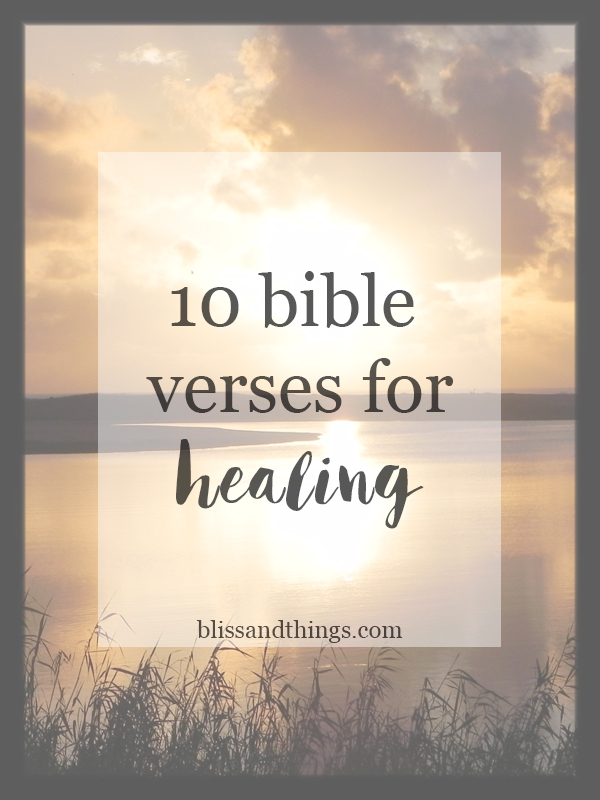 Some may not seem like your traditional “healing” verses, but I wanted to touch on a variety of ailments that may leave a person feeling the need to cry out to God for help. They all vary in many ways, but they do have one similarity: they leave me feeling peaceful, hopeful, and comforted knowing that God is in control. What is some of your favorite scripture for healing? Please share below! Note: I made several changes to the site recently, including switching hosts and blogging platforms. Let me know if you see anything funky! Another note: You can now pin any images I include in my posts by clicking on them! Love all these bible verses. Very good source of inspiration! Thank you for sharing!